LONDON--(BUSINESS WIRE)--The global yogurt market research report by Technavio predicts the market to post a CAGR of more than 5% during the period 2019-2023. To enhance their appeal among consumers globally, vendors have been introducing new and healthy formulations of yogurt with innovative flavors combining toppings of fruits, nuts, and other savory snacks. The vendors have also been diversifying from traditional yogurt offerings. They are introducing flavored yogurt snacks to differentiate their offerings, beat the competition, and promote yogurt as an on-the-go snack. “Many vendors are taking the initiatives to improve the taste and variety of their products, which will encourage consumer uptake. Vendors are also reinventing the dairy experience by introducing dairy-free yogurts to cater to the lactose-intolerant demographic, with the use of alternatives such as coconut and soy milk,” says a senior research analyst at Technavio. This yogurt market analysis report segments the market by product (spoonable yogurt and drinkable yogurt) and geography (APAC, Europe, MEA, South America, and North America). The spoonable yogurt segment held the largest yogurt market share in 2018. The increasing popularity of Greek yogurt has been one of the major factors driving the growth of spoonable yogurt segment. APAC accounted for the highest share of the market in 2018. The major factors driving the market in this region are the growing number of product launches, the rise in the number of organized retail outlets, preference for a healthy lifestyle, and increasing popularity of flavored yogurt beverages. 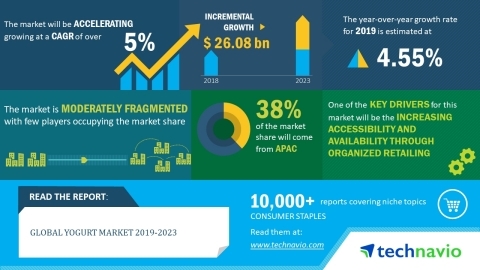 The global yogurt market research report by Technavio predicts the market to post a CAGR of more than 5% during the period 2019-2023.